These no sugar added baked oatmeal bars are a great healthy finger food for babies and toddlers. I can’t tell you how long I searched on Google to find a recipe for no sugar added baked oatmeal bars. And I don’t just mean a recipe with no cane sugar. I mean one without maple syrup, honey, agave, coconut sugar, etc. Because you know what? They’re all sugar, just different names. And for babies, it’s important to avoid all added sugars in their diet. But I kept coming up empty handed. Most recipes that claim to have no added sugar or are “naturally sweetened” still have a sweetener like maple syrup. That is deceiving! So, here we are. My very own recipe that I’ve made countless times for my baby girl. I experimented A LOT before I came up with a recipe that had the right flavor and texture. This is the winner! I like to freeze most of the batch after I slice and cool the bars. I love having them on hand when I need a quick meal or snack for her. Oh, and did I mention that these are not messy? That may be my favorite part. I get to feed my baby oatmeal without a sloppy mess all over her face, hair, clothes, and floor. Of course there will be some crumbs, but it’s nothing compared to a big gloppy bowl of oatmeal! I adapted this recipe from the Maple Cinnamon Oatmeal Breakfast Bars on Iowa Girl Eats. I highly recommend trying that recipe for the adults in your house! 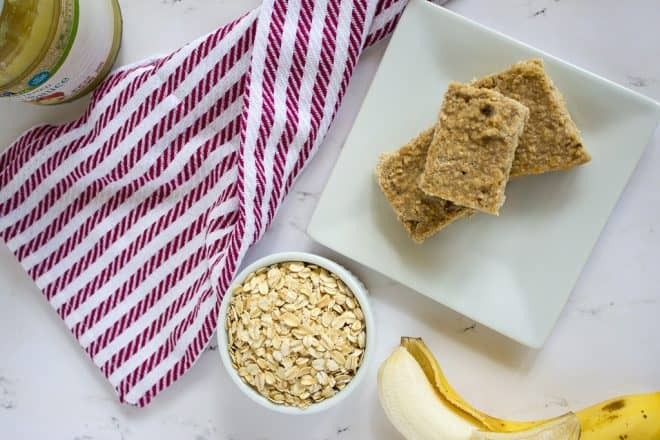 Typically, I will get out two big bowls and make one batch of these no sugar added baked oatmeal bars for the baby, while also making a batch of the Maple Cinnamon Oatmeal Breakfast Bars at the same time. Since it’s mostly the same ingredients, it’s not too much extra work. Also- if your kids are past the baby phase, definitely try my Pumpkin Baked Oatmeal Bars. They do have some sweetener in them, but it’s still pretty low compared to most recipes out there. Can you tell we love oatmeal bars in this house? If you need to make this recipe dairy-free, I’d suggest canned coconut milk in place of the whole milk. I haven’t tried it myself though, so let me know if you try it with any substitutes! These no sugar added baked oatmeal bars are perfect for your baby or toddler. Lightly sweetened only with fruit, you can feel good about the wholesome ingredients in these bars. Preheat oven to 350 degrees then spray an 8x8" baking pan with nonstick spray, or line with parchment, and set aside. Add milk, mashed banana, applesauce, coconut oil, egg, and vanilla to a large bowl then whisk to combine. Add remaining 1-1/2 cups oats, oat flour, cinnamon, pumpkin pie spice, baking powder, and salt then stir to combine. Fold in flax and hemp hearts, then pour batter into prepared baking pan. Bake for 30-35 minutes, or until the edges are golden brown and the center has set. Cool before slicing into squares then store in the refrigerator, or individually wrap bars and freeze. Recipe adapted from Iowa Girl Eats Maple Cinnamon Oatmeal Breakfast Bars. Have you tried adding something like peanut butter to these? And can we use milk alternative like almond milk? Hi! I’ve only added peanut butter after baking- I slice it and put peanut butter in the middle like a sandwich. And yes you can use any milk! Awesome, can’t wait to try these! Thank you for posting! Can you use another type of oil? I haven’t tried another but I assume it would be fine!